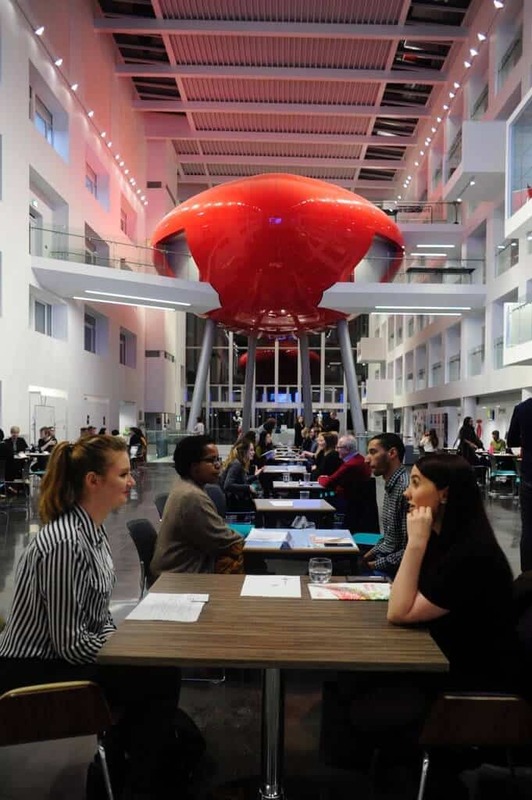 Solent University’s annual ‘Meet the professionals’ event got off to a great start this year, with some inspiring talks from selected professionals in the PR and Marketing industry. Whilst the students were listening intently downstairs, we were setting-up upstairs, awaiting their eager questioning. As well as a great opportunity to talk to the soon-to-be-graduating students, the chance to connect with professionals in the local area was also enlightening. GottaBe! has attended this event for the last few years. This year it was the turn of our newly graduated Account Support Executive, Shanice Walker to reveal some of her tips and tricks to finding a job after leaving university. Shanice was joined by Jake Tansley, also Account Support Executive who secured his placement at GottaBe! at the same event, although a year ago. The ‘speed dating’ format of ‘meet the professionals’ provided a fresh view on networking; allowing our team members to mix with other like minded PR and Marketing experts. It’s events like these that make us excited about the growth and innovation in store for our industry. We look forward to next year and hope that all the Solent students make the most of these opportunities. If you have a missed out on Meet the professional’ event or you’re a student from a different University than Solent and would like to join our team as an intern or for work experiences then e-mail us at iwanttowork(at)gottabemarketing.co.uk telling us why you would like to work here.